Most analysts are unerringly polite on earnings calls with executives, complimenting their hard work and gently probing them for context and clarity. Not Ali Dibadj of Bernstein, who has actively called out the CEOs of some of America's largest corporations and grilled them on their strategies and shortcomings. Procter & Gamble's CEO debuted a product strategy of "irresisible superiority" in its latest earnings call. "I'm confused about how investing back into the business for no share gain and...limited pricing growth is a good deal for investors", Dibadj responded. "Would it be better to admit...that your categories are becoming [less] important to consumers, and investing in this irresistibility is actually the wrong strategy?" Meanwhile, the boss of Dr Pepper Snapple sung the praises of Bai, an antioxidant-infused drinks supplier acquired this year. Dibadj wasted no time pointing out a "massive slowdown" in the brand's sales according to Nielsen data. He also highlighted the "lack of success" and "very, very low" repeat purchases" of newer offerings such as Bai Bubbles, which suggested to him that non-core product launches "are actually getting worse...for lack of a better word". Dibadj's sentiments were just as straightforward on other calls. He pointed out Avon's free cash flow was "nowhere near where it should have been", adding that he isn't comforted by the lack of improvements and gets "worried a little" by other issues. He was "shocked" that Estée Lauder's inventory levels aren't improving, and "disappointed and surprised" given the company's recent software upgrade. And he showed no qualms about flagging PepsiCo's "difficulty...perhaps inability" to drum up impulse purchases from online customers. Dibadj's blunt, incisive questions reflect his deep knowledge of companies and strong beliefs about how they should be run. "I simply believe management teams should be accountable to shareholders - a novel idea sometimes, I know," he wrote in an email to Convershaken. "I've had the opportunity to work in many different industries executing operations, capital allocation, and governance change, so I can't help but focus on where companies can do better to drive shareholder value." In particular he credits his time as a McKinsey consultant for giving him a "BS-meter", according to a Barron's interview. His familiarity with the inner workings of companies means he can "question management...much differently," he said. "Because of my background, I push companies to do things that are uncomfortable, but benefit shareholders." 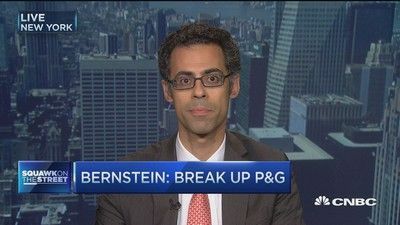 Bernstein often hires people from industries who can "ask tough questions, check on management teams a bit aggressively, raise the level of conversation", Dibadj said in the interview. If CEOs know they'll be challenged, they may think twice before making promises and obfuscating. Wall Street could certainly use fewer sycophants, and more analysts who aren't afraid to hold executives to account.